Area Req : 250 - 500 sq. ft.
A Tasteful Business Proposition You will Certainly Relish! Say sandwich and the first name that will come to mind is Sandwich Square. it’s a household name with a strong customer base cutting across all age group. With over 50+ outlets across 10 cites and One Master Franchise in Dubai. Sandwich Square have over 143 variants of sandwiches, each one a gastronomical delight. Apart from this Sandwich Square offering include ice Cream Sandwiches, desi burgers, Indian Pizza, Maggi, French Fries and Other lip smackin’quick bites. 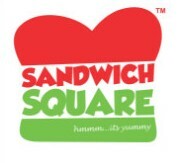 Why Franchise with Sandwich Square ? Sandwich square provide complete suppport systems that includes sire selection, infrastructural set up, raw material procurement, cloud based billing – inventory system, online delivery integration, payment gateways and marketing and advertising tools.